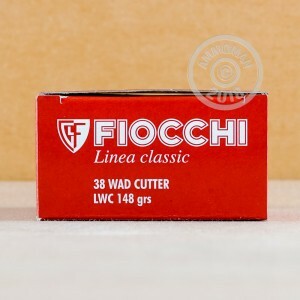 This wadcutter load from Fiocchi is the perfect target round for your .38 Special or .357 Magnum revolver. The 148 grain wadcutter bullet has a flat-fronted profile that punches neat, clean holes in paper and shows you where your shots landed. The nice round hole makes it clear if you've landed two rounds right next to each other. These features come at a minimal difference in cost, so stock up for a better range experience! Each case contains 50 rounds with non-corrosive Boxer primers and reloadable brass cases. 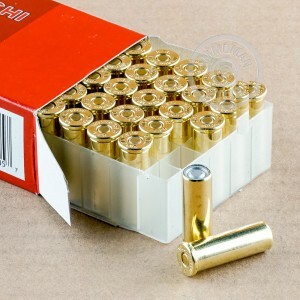 Wadcutter bullets, generally used in revolvers for target and competition purposes, produce great accuracy at ranges up to around 50 yards, more than enough for any kind of pistol shooting. Before the advent of hollow point ammunition, some shooters also used wadcutters for self-defense as an attempt to improve on the poor terminal performance of lead round nose bullets. Buy a few boxes of this ammo or any other items from AmmoMan.com. Once your order total tops $99, you'll qualify for free shipping! Very happy with shipping and customer service! Ammo great! I bought this ammo for my Cimarron El Patron. Ammo performance was flawless. Light recoil, perfectly round holes and POA was POI. I'd recommend these wadcutters to any cowboy action shooter or someone just plinking around.